1. Education should be given to all irrespective of any Social/Economic discrimination..
2. 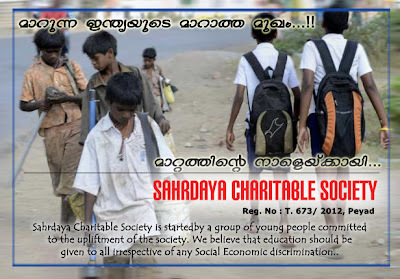 We aim to maximize our charitable works & area of service, in coming years..
Sahrdaya is a Govt Registered Charitable Society started by a group of young people committed to the upliftment of the society.We believe education should be given to all irrespective of any Social/Economic discrimination. Tvm/tc/673/2012. Registered on April 8, 2012. Behind Sahrdaya there's a team. We've a greater ground support. There is a team of 25 youngsters, behind Sahrdaya. In addition to this there's a team of about 18 other members behind Sahrdaya. Sahrdaya is a venture of youth, few inspired minds vowed to improve the living of at least a single human a year and to bring smiles together. The Term 'Sahrdaya' Is Taken From Sanskrit, Which means sincere, sensible, hearty, possessing a heart, good-hearted, full of feeling, with the heart.. 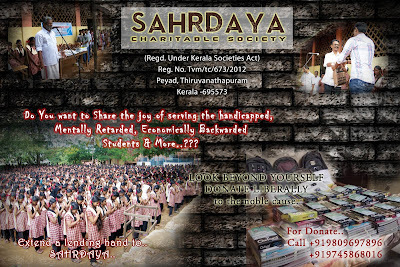 Opportunity to serve community, nation and world: Sahrdaya is a Non-profit organization is known for our social welfare at schools , Mental Rehabilitation Centers, Old age homes,community and even at National level. We pick up the areas those are not covered by the State/Government or where State does not have departments or provisions. for the purpose. We believe in our Volunteers, They're best with humanitarian values.. Non-Profit Motto: The best thing is Sahrdaya work not for profit but strictly for services. Protection of Rights: Sahrdaya are also organized to protect the interest and rights of its members, and to provide services to its members. Co-operation: Sahrdaya is looked up respectfully by the State and General public, and therefore they get maximum cooperation from all sectors. Experienced Management: Sahrdaya is formed by interested and experienced group, so we are able to perform professional management activities.